2 pages version of my resume (Nov 2012) in pdf (User Experience Researcher). User experience researcher, I conduct cutting edge research to inform and inspire the design of products. I provide foundations and design directions to drive innovation and delighting user experiences. I help the business align high area investments with high quality user experiences. I use creative problem solving to fit the constraints of the business while seeking to provide design insights. Grounding, inspiring and informing the current and next generation experiences of home shopping and selling experiences. Conducted user research to inform the development of current and future Surface products, including the Surface Pro 3, Surface Pro 4, and Surface Book. Iterated on previous research for best for factors for digital pens and styluses, provided a UX-driven strategy for the success of digital pen, aggregating dozens of internal studies as well as research by other Microsoft teams and third parties. Provided support to drive pen as a priority across the company, consulting with various groups across Microsoft and leading research on the Windows pen experience (in particular in the Windows 10 planning phases and for the new inking engine DirectInk). Developed innovative qualitative and quantitative methods and tools to assess and understand the digital pen experience, including log analysis tools, beta testing processes, questionnaires, etc. Conducted iterative studies to identify the best materials for pen tips and erasers to optimize feel and life. Deeply supported reliability engineering through data-driven user modeling and movement analysis. Lead researcher for the Surface Pro 3 pen, including the One click for OneNote feature. I conducted numerous studies to refine the design of the new generation pen, helping shape design and engineering decisions, but also providing insights to marketing and business teams regarding the role and potential of digital pen technologies. Surface Music Kit Led the research on this top-secret project from both hardware (the Music cover) and app perspective. Defined experience goals and metrics which helped refine the engineering process, and helped focus the design direction of the app through an analysis of digital music beginners and advanced users. Secret projects I was also involved on a few unreleased projects, looking at new and innovative ways to marry hardware and software, and working hand-in-hand with design to innovate and inspire engineering. I planned and executed research to support the user experience of developers using Microsoft platforms and tools including formative research: ethnographic observation, interviews, competitive reviews, literature reviews, and evaluative research: usability studies, sentiment analysis. I applied those methods to a variety of needs, including online assets (tools, services, and documentation), software libraries (api), and for global user segmentation and audience understanding. Particular areas of focus included developer collaboration and developer information needs for application lifecycle management, where I conducted a series of site visits identifying key tasks for the system to support, and pain points that users of such systems commonly have. I constantly evangelized design- and evidence-driven engineering processes to partner with engineering teams and participated in shaping the UX strategy in the division and the company. I relied largely on the BUILD-MEASURE-LEARN trend initiated by the lean startup book to articulate the need to identify and test hypothesis related to customer behavior and preferences. I enjoyed mentoring others (e.g. interns, junior colleagues), and helping other disciplines understand and apply user experience principles. I assisted in advising graduate students on two projects: the analysis of video data to study an online end-user programming environment which contributed clear and grounded recommendations for the design of end-user programming environments; and the study of the role of feedback in helping users understand and use machine-learning systems such as spam filters. I also conducted participatory design to create and evaluate design concepts of always-on display for presenting consumption information. The study outlined a framework and guidelines for the design of feedback technologies in the home. 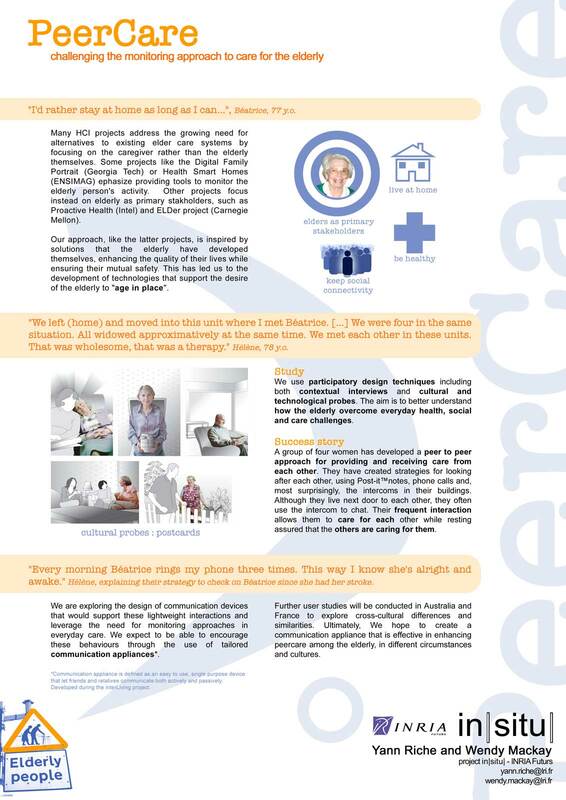 I studied how computer mediated communication could support aging in place using a design-focused approach. I first conducted 3 studies to understand the role communication played in successful aging. I then designed a variety of communication systems for older adults, for which I collected feedback using focus groups, role playing, and other design activities. I chose the most promising design and implemented a fully functional prototype of a concept called markerClock, which I refined over the course of 3 months using feedback from older adults, and dogfooding. I finally deployed the device in two pairs of households, allowing me to inform the larger design space of communication appliances for older adults. I also taught computer science and human computer interaction to graduate and undergraduate CS students. at the University of Paris South (http://www.u-psud.fr FRANCE). Topic: Communication appliances to support aging in place. Equivalent to a Master degree at the Grenoble Institute of Technology, France. (Preceded by intensive classes for higher education studies from 1998 to 2000). Conducted participatory design activities to create and evaluate design concepts of always-on display for presenting consumption information. Designed mockups using Photoshop and an interactive prototype using Java. This study provided a framework and guideliens for the design of feedback technologies in the home to be presented at a major HCI conference. Designed and conducted the analysis of video data to study an online end-user mashup programming environment from a design perspective. Results provided implications for the design of end-user programming environments (e.g., MS Popfly) to improve usability, ease of use, and efficiency. Designed and conducted the evaluation of visual feedback of a desktop machine-learning application to help users and machine collaborate more effectively. Created and implemented visualizations of machine-lear-ning data and designed visualizations for the analysis of logged data. Designed several concepts and prototypes of communication devices to support aging in place using user-centered methodologies and participatory design techniques. Designed, prototyped and field tested markerClock, a communication device based aimed at supporting home rhythms awareness between elderly friends. Conducted iterative design from the field study to prototypes (low fidelity to functional). The field test included site visits, interviews and questionnaires and log data analysis, and allowed me to validate the markerClock concept and to iterate on the design. Designed and experimentally evaluated a multi-focus technique for visually exploring large amounts of data which proved experimentally more efficient than both traditional and split-screen views for conserving contextual awareness during exploration. Designed, implemented and field evaluated an automated video observation tool prototype using automatic logging, interviews and focus groups with study participants and researchers. Designed and prototyped (pen-and-paper, Photoshop, and wireframe) an application for handheld devices (PDAs) allowing teachers to remotely and easily manage technologies in the classroom (video projectors, printers, laboratory computers, etc.). Extended the design concept by proposing a concept of location-aware device for controlling appliances and devices in the Home. Conducted observational studies of physical collaboration in two architectural firms in Brisbane, Queensland. Outlined the role of the physical media for collaboration as well as the use of freeform sketching in design activities. Collaboration with fellow research intern, under the supervision of research staff. Results were published in a research article at the 2004 Cooperative Design, Visualization, and Engineering conference. Yann Riche and Wendy Mackay, in CSCW: the Journal of Collaborative Computing, Springer Verlag (2010, to appear). The Role of Conceptual Knowledge in API Usability Andrew J. Ko and Yann Riche in Proceedings of the 2011 IEEE Symposium on Visual Languages and Human-Centric Computing (VL/HCC). Studying Always-On Electricity Feedback in the Home Yann Riche, Jonathan Dodge, Ronald A. Metoyer, Proceedings of CHI2010 (the ACM SIGCHI Conference on Human Factors in Computing Systems). End-User Mashup Programming: Through the Design Lens Jill Cao, Yann Riche, Susan Wiedenbeck, Margaret Burnett, Valentina Grigoreanu, in proceedings of CHI2010 (the ACM SIGCHI Conference on Human Factors in Computing Systems), 2010. Mélange: Space Folding for Multi-Focus Interaction Nikals Elmqvist, Nathalie Henry, Yann Riche and Jean-Daniel Fekete, Proceedings of the CHI2008 (the ACM SIGCHI Conference on Human Factors in Computing Systems). Zebra : Exploring participatory design engagement in fieldwork Yann Riche, Stephen Viller, Matthew Simpson, Proceedings of DIS2008 (the ACM SIGCHI Conference on Designing Interactive Systems). Hard-to-Use Interfaces Considered Beneficial (Some of the Time) Yann Riche, Nathalie Riche, Petra Isenberg, Anastasia Bezerianos, in Extended Abstract of the ACM SIGCHI 2010 Conference on Human Factors in Computing Systems (Apr. 2010) markerClock: A Communicating Augmented Clock for Elderly Yann Riche, Wendy Mackay, Extended Abstracts of INTERACT 2007 (the IFIP 2007 International Conference on Human-Computer Interaction). Une horloge communicante pour les séniors Yann Riche, Wendy Mackay, Extended Abstracts of IHM 2007 (the Conférence Francophone d'Interaction Homme Machine). PeerCare: Challenging the Monitoring Approach Yann Riche, Extended Abstracts of INTERACT 2007 (the IFIP 2007 International Conference on Human-Computer Interaction). An Observational Analysis of Collaborative Actions in the Design Industry Yann Riche, Matthew Simpson, Lorna MacDonald, University of Queensland, November 2003. INFO400 Informatics Capstone Class, Undergraduate. Design and Evaluation of Interfaces, Graduate. Introduction to Computer Science, Undergraduate. Information Environments Studio 1, Undergraduate. User Experience Researcher Consultant at Microsoft in the Developers' Division. Planned and conducted user research in the topic of help, documentation usage and community for developers. Designed, planned, onducted, analysed and reported on more than five studies regarding the usage of documentation and other content in the development lifecycle. This position led to my hiring at Microsoft as a full time employee in February 2010. IT engineer for an IT services company. Software development in ABAP, for a SAP system. Internship in a dive shop. PADI Rescue Diver and PADI Divemaster certification, First Aid certification. Initial development of the website of the training center: http://www.pleasuredivers.com.au. In charge of industrial relationship: increase of 100% of industrial participation to the budget. Team management. Organisation of students' events. Various jobs and internships since 1998. Photography (Flickr site), Scuba Diving , Movies and Reading.